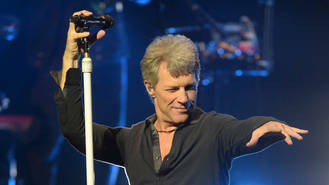 Bon Jovi and the late Nina Simone are to be inducted into the Rock and Roll Hall of Fame. The Livin' on a Prayer rockers and the R&B and jazz pioneer, who passed away in 2003, will join The Cars, Dire Straits and The Moody Blues as the honourees at the 33rd induction ceremony at the Public Auditorium in Cleveland, Ohio on 14 April (18). Bon Jovi keyboardist David Bryan expressed his delight in receiving the honour after years of hard work in the band, who take their name from frontman Jon Bon Jovi. "It's a Christmas miracle," he told Rolling Stone. "(We were) guys living the dream, getting on a bus with no guarantees in any way,Â shape, or form or anything. It was, 'Let's go out and make this happen.' And we actually did." Bryan would also love former Bon Jovi members Richie Sambora and Alec John Such to join them to perform at their induction and stated, "The idea is that it's a celebration of what we were and what we are." Acts who were nominated but failed to make the final cut include Radiohead, Kate Bush, Depeche Mode, Rage Against the Machine, Judas Priest, Eurythmics, and LL Cool J.
Moody Blues singer Justin Hayward is equally delighted his group has been chosen, gushing, "I'm extremely grateful to the Rock and Roll Hall of Fame for two things: For creating the supreme temple to something that has brought me endless joy since I was a little boy. The second thing is for, after all these years, including us." The inductees were chosen via a ballot of more than 1,000 artists, historians, and music-industry professionals. To be eligible for the Rock Hall, an act must have released their first recording at least 25 years ago. British rock band Dire Straits are also to enter the Hall of Fame, 26 years after their final gig together before their 1992 split. Like Bon Jovi, inducted bands are often keen on reuniting for the ceremony, but frontman Mark Knopfler is yet to indicate if he would be open to this. Sister Rosetta Tharpe, a gospel pioneer from the 1930s who passed away in 1973, will also be honoured with the Award for Early Influence at the upcoming ceremony. John Legend has signed on to play the title role in NBC's live version of Jesus Christ Superstar. Beyonce's lawyers have fired off a cease-and-desist notice to the owners of a New York pop-up bar dedicated to the superstar. Ed Sheeran was fighting back tears as he reworked his hit Perfect with opera superstar Andrea Bocelli at his home in Tuscany, Italy. Dance superstar Tiesto is helping to keep the party going for Las Vegas visitors after extending his club residency into 2020. Gwen Stefani and Blake Shelton use song to communicate with each other. Chris Brown has been panned by social media users after gifting his daughter Royalty a pet monkey. British pop star Ed Sheeran still cannot believe he secured a feature from Beyonce for the remix of his song Perfect. Rita Ora has sent fans wild with a very revealing snap from Love Magazine's new advent calender.